First a traitor and later King Edmund the Just in the Golden age of Narnia, who grows from the sensual, difficult, jealous nine- or ten-year-old in The Lion, the Witch, and the Wardrobe to the handsome and brave twenty-four-year-old king of The Horse and His Boy and the helpful and playful nineteen-year-old youth who is ... in The Last Battle. For those of you who do not know, Edmund betrayed both his family and the entire country of Narnia very shortly after he first arrived when he aligned himself with the White Witch. It was for him specifically, in fact, that Aslan had to die in order to defeat the Witch. There [the Pevensies] saw Aslan and Edmund walking together in the dewy grass, apart from the rest of the court. There is no need to tell you (and no one ever heard) what Aslan was saying, but it was a conversation which Edmund never forgot. 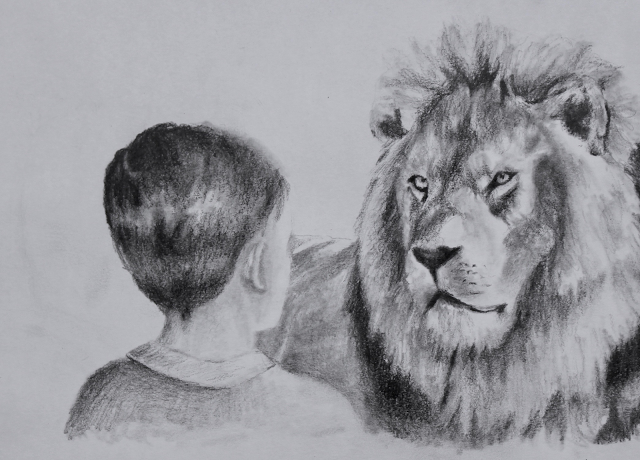 As the others drew nearer Aslan turned to meet them, bringing Edmund with him. "Here is your brother," he said, "and-- there is no need to talk to him about what is past." Aslan has forgiven Edmund completely, portrayed his grace to him, and encourages his siblings to do the same. After this horrendous event of betrayal, Lewis makes clear to note in every book that Edmund appears in thereafter how Aslan's grace inspired Edmund and allowed him to be merciful and an encouragement to others. "It is very true," said Edmund. "But even a traitor may mend. I have known one that did." And he looked very thoughtful. "Well, there's just this," said Edmund, speaking quickly and turning a little red. "When we first discovered Narnia a year ago- or a thousand years ago, whichever it is- it was Lucy who discovered it first and none of us would believe her. I was the worst of the lot, I know. Yet she was right after all. Wouldn't it be fair to believe her this time?" "... I'd like to apologize. I'm afraid I've been pretty beastly." "It wasn't at all like that other time when we were pulled out of our own world by Magic. There was a frightful roar and something hit me with a bang, but it didn't hurt. And I felt not so much scared as -well, excited." After this Edmund goes remarkably quiet, but I do not blame him for the wonder of what he was seeing and the marvel of Aslan's grace bringing him to these moments. But this is all in a fictional story! you say. This is no proof that God treats us this graciously and uses us this way! You would be correct if my only reference was a fictional children's story, but Lewis was tricky when he named Peter, Peter and Edmund, Edmund for Edmund shares much in common with Jesus' disciple Simon Peter. Note that Peter's betrayal occurred just before Jesus' death, just as Edmund's occurred right before Aslan's- drawing the connection closer. And as Jesus had said, Peter did betray him. But then Peter went on. He repented of his sin, became a leader for the church, wrote letters of encouragement, faced flogging and derision for speaking Christ's name, preached sermons, and was eventually martyred for God's kingdom. 1 Peter 5:6-10 is a great example of how Peter uses his experiences to encourage and warn the disciples. We have all betrayed God. In a big way or a "small" one, "all have sinned and fall short of the glory of God". Yet- we are God's people, and more than that we are his servants charged to proclaim the Gospel and minister to the saints.